by Welsch, Robert L.; Vivanco, Luis A. What is cultural anthropology, and how can it explain--or even help resolve--contemporary human problems? 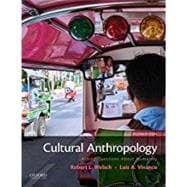 Robert L. Welsch and Luis A. Vivanco's Cultural Anthropology: Asking Questions About Humanity, Second Edition, uses a questions-based approach to teach students how to think anthropologically, helping them view cultural issues and everyday experiences as an anthropologist might. Robert L. Welsch is Associate Professor of Anthropology at Franklin Pierce University. Luis A. Vivanco is Professor of Anthropology and Co-Director of the Humanities Center at the University of Vermont. What Do the Four Subfields of Anthropology Share in Common? How Do Anthropologists Know What They Know? How Do Anthropologists Put Their Knowledge to Work in the World? Applied and Practicing Anthropology: The Fifth Subfield? What Ethical Obligations Do Anthropologists Have? Do Not Harm. But Is That Enough? Take Responsibility for Your Work. But How Far Does That Go? Share Your Findings. But Who Should Control Those Findings? --THINKING LIKE AN ANTHROPOLOGIST: Should Anthropologists Take Responsibility for the Influences They Have on the Societies They Study? If Culture Is Always Changing, Why Does It Feel So Stable? How Do Social Institutions Express Culture? What Distinguishes Ethnographic Fieldwork from Other Types of Social Research? Seeing the World from "the Native's Point of View"
How Do Anthropologists Actually Do Ethnographic Fieldwork? Participant Observation: Disciplined "Hanging Out"
What Other Methods to Cultural Anthropologists Use? What Unique Ethical Dilemmas Do Ethnographers Face? How Do Anthropologists Study Language? How Does Language Actually Work? Does Language Shape How We Experience the World? Is the Sapir-Whorf Hypothesis Correct? If Language Is Always Changing, Why Does It Seem So Stable? How Does Language Relate to Power and Social Inequality? What Are the Outcomes of Global Integration? Doesn't Everyone Want to Be Developed? If the World Is Not Becoming Homogenized, What Is Actually Happening? How Can Anthropologists Study Global Interconnections? Why Is There No Universal Human Diet? Why Do People Eat Things That Others Consider Disgusting? How Do Different Societies Get Food? How Are Contemporary Foodways Changing? The Return of Local and Organic Foods? Do All People See of Nature in the Same Way? How Does Non-Western Knowledge of Nature Relate to Science? Are Industrialized Western Societies the Only Ones to Conserve Nature? How Do Social and Cultural Factors Drive Environmental Destruction? Is Money Really the Measure of All Things? How Does Culture Shape the Value and Meaning of Money? Why Is Gift Exchange Such an Important Part of All Societies? What Is the Point of Owning Things? Does Capitalism Have Distinct Cultures? Does Every Society Have a Government? Why Do Some Societies Seem More Violent Than Others? How Do People Avoid Aggression, Brutality, and War? Is Restoring Harmony Always the Best Way? The Biological Meanings (and Meaningless) of "Human Races"
How Is Race Culturally Constructed? How Are Other Social Classifications Naturalized? Are Prejudice and Discrimination Inevitable? How and Why Do Males and Females Differ? Do Hormones Really Cause Gendered Differences in Behavior? Why Is There Inequality Between Men and Women? What Does It Mean to Be Neither Male Nor Female? Is Human Sexuality Just a Matter of Being Straight or Queer? What Are Families, and How Are They Structured in Different Societies? How Do Families Control Power and Wealth? How Are Social and Technological Changes Reshaping How People Think About Family? How Should We Understand Religion and Religious Beliefs? What Forms Does Religion Take? How Does Atheism Fit in the Discussion? How Is Religion Linked to Political and Social Action? How Do Biological and Cultural Factors Shape Our Bodily Experiences? What Do We Mean by Health and Illness? How and Why Do Doctors and Other Health Practitioners Gain Social Authority? What Can Anthropology Contribute to Addressing Global Health Problems? Why Is the Ownership of Artifacts from Other Cultures a Contentious Issue? How Can Anthropology Help Us Understand Objects? How Do the Meanings of Things Change Over Time? How Do Objects Come to Represent Our Goals and Aspirations?